I've been working with clients on an upcoming wedding in February, and once again I'm amazed at how many issues have surfaced while collaborating on the shot list. After two weeks of back and forth, it's a different event than had originally been portrayed. This is why I am such a proponent of shot lists for event photography. It is the best tool for discovering client expectations and seeing what is actually going on in their head. Many shooters have asked me, "Can't you simply discuss the wedding with the client?" You can, and you should. But don't let those conversations be your blueprint for the event. First, there is no record of what you agreed upon. After the wedding is over, and they are complaining about a shot you missed, it's your word against theirs, and that's not a situation you want with a client. People sometimes "think" they told you something, but don't actually verbalize it. A shot list is also your opportunity to fine tune the timing of the shoot. If the client, for example, lines up 20 group shots after the ceremony, but only provides 15 minutes between the end of the ceremony and the start of the reception, you need to intervene and suggest alternatives. I usually go three rounds of working out the shot list with clients, and most of that time is spent smoothing out the flow of the day. Once everyone is satisfied with the contents and timing of the shot list, make sure the clients get a final copy and approve it. Also make sure that all of your assistants (and you) have it in your pocket during the event. I have one assistant assigned to checking off items during the course of the event. In the end, this leads to a less nerve-racking shoot for you and more satisfied clients. 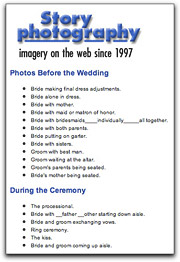 If you need a starting point for a wedding shot list, you can download a sample shot list here. I highly advise you use a shot list for every event. FotoTimer made by Mac About Town, provides a nifty self-timer for your iPhone. 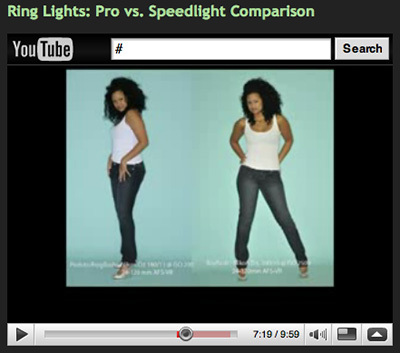 In fact, it's better than many of the self-timers built into dedicated digital cameras. You can set the delay for 2, 5, 10, or 20 seconds. This $1.99 program available from the iTunes App Store will help you capture sharp images with the iPhone. Just set it down, set the timer, stand back, and let it record the image. 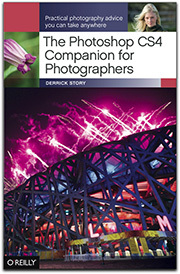 For anyone who enjoys photography with their iPhone, I would consider this app essential. I'm moving forward on this geotagging project on two fronts. One task is to geotag everthing I've already shot in 2009. On the second front, I want to use a GPS device to create data while I'm in the field. For the GPS device, I decided to give the Jobo photoGPS Geo Tagging Flash Shoe a try because of its small size and ability to stay out of the way in the hotshoe of my camera. The Amazon listing, and everywhere else I looked, said that the Mac software would be ready by the end of 2008. So I naively expected it to be in the box with the photoGPS. What I did find in the box was a link on a CD to a mailing list that would notify me when the Mac software was ready. No timeframe is listed. Just sign up for the list, and we'll let you know. OK, not so great. I'm going to hold off reviewing this device until I actually incorporate it into my workflow. At the moment, I'm probably going to have to try the Windows version of the bundled software to learn more about it. Note to Jobo: It's 2009. The second part of the project is going a little better. I've decided to try Maperture for the images already in my Aperture library. This plug-in is free and easy to use. Ubermind provides a nifty screencast to provide a hands-on overview of the product. I'm still getting to know Maperture, and will have more details about it after further testing. But my first impression is good. I should have another update sometime next week. Once I get everything working to my satisfaction, I'll also record a podcast on geotagging. More soon. What a great story! I was reading the Amazing Coverage of U.S. Airways Rescue story on PDN and thinking about how citizen journalism is having an impact on our nation's news reporting. 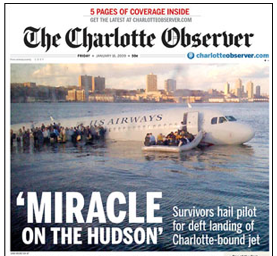 The U.S. Airways Flight 1549 crash and rescue in the Hudson River has to be one of the top stories of 2009, and the iconic image of the rescue was capture with an iPhone. If there ever was an argument for, "the best camera is the one you have with you," this is it. According to PDN writer Jim Davidson: "The star of the early coverage is a Florida tourist named Janis Krums of Sarasota, Florida, who was on one of the ferry boats in the Hudson River in New York when the plane crashed. Krums posted a photo from his iPhone, Twittered about the crash and did an interview with MSNBC." You can catch up on most of the photo announcements from CES in one spot: dcviews.com. 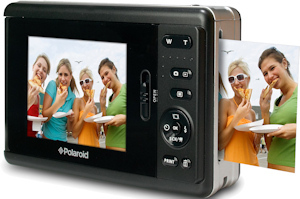 Recent products from Kodak, Sony, Samsung, Casio, Olympus, Canon and more are listed on the home page. When you want the new blurb, just click on the item and the news box at the top updates. You can get the full story too if you want it. 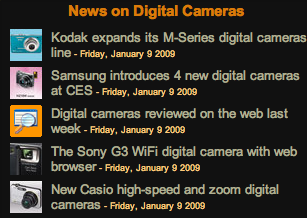 It's an easy way to catch up if missed the action at CES (like those of us who were at Macworld).